I hate to do this, but there is no way book 2 will be ready to go by the time I said it would. I’m on my second proof, and there needs to be at least one more after that – in addition to some beta readers, incorporating their feedback, and hiring a copy editor. Hopefully all of that should not take long. I could post it as is right now but there are still a lot of problems with it and that would not be wise. I’ve been slammed in reviews for grammar – while my writing is not as bad as a lot of stuff that’s published, it’s not at the level I would like to be and I’m willing to pay a professional to do it. I’m still looking for a decent copy editor, and hopefully I can have something worked out by this weekend. I tried to get this book out from start to finish in about two months. I just now feel like it’s getting within publishable range, but I really didn’t give myself enough time to finish it. For book 3 I’ll take at least three months. Hopefully when I get it out it will be fully ready. Well, this is the third time I’ve posted this month, which is a bit inexcusable. It’s not that I haven’t thought about blogging. I’ve been exhausted. I don’t really know why. I want to say it’s work but not really, because I blogged like crazy all through February. That, and for the first time since December, I’ve been getting distracted from my writing. Don’t get me wrong. I’ve finished two first drafts since then, the second of which is book 2 of Wasteland. Motivation has been hard to find, but I have ten days until it’s set to go online. Which really isn’t much time for a document that’s hardly been looked at that is 185 pages long. The book is still struggling to find its voice and I hope ten days is long enough to find it. I’d hate to put it off but it goes up then for better or worse. Good news though, the cover is done, looks awesome, and will be posted soon. I’ve done a couple giveaways of Apocalypse on Goodreads. Together, 1,600 requested a copy of the book which is insane. I was getting more requests than real life professional authors which was a little flattering. This probably the most successful promotion I’ve done of the book besides the free days I did with Amazon. I plan on doing another one once book 2 is out. I really think that if book 2 is also good, then this could be the thing that lets the book pick up steam. I’ve really learned a lot in the past few months, the chief of which is to keep plugging away and not lose the momentum you’ve built up for yourself. Whatever it is you want to do in life just keep at it and doing that thing starts to become a habit and not constant drudgery. Also, I’m back to reading now which is helping my writing quite a bit. It’s been hard to get inspired to write anything. Mixture of tiredness and trying to finish this book. I’m trying not to get burned out on the whole thing. Looking at how much work needs to be done it will be a miracle if book 2 gets published by the 31st. Between how tired I am after work and how tired I feel when I wake up it’s hard to just sit down and do it. Makes me wish I did this full time but I’m not there yet, but I will never get there unless I keep going. I’ve come pretty far already but it’s not far enough. I still need to get better and write more. I don’t really know where this drive is coming from but it’s a good thing. I can’t really sit back right now. I feel a sense of urgency about this I can’t really explain, like it’s an opportunity I’m going to miss if I’m not ready for it. Editing is real slow right now. I’ve only made it past the first few pages. Chapter one is readable now, though probably still has lots of typos. I’m a little afraid to read the rest because there is so much. Just to think I have to finish it all in about two weeks seems a bit overwhelming. I’ll have to do a lot this weekend and lock myself in my room to make sure it gets done. That might sound extreme but I feel like I’m losing my focus a bit so I need to get back on the horse. Coffee…I think I just need lots of coffee. Either way tomorrow is Friday so hopefully this weekend can be very, very productive. Well, I did it. I completed my fifth book (it’s fifth I think? ), and soon-to-be published third book. Origins was a lot of fun to write. A lot of fun. Probably the most fun of any book I’ve written. I think the beginning is kind of slow…but once it hits word 20,000 it really picks up. Then again, I don’t think I can tell until I go back and read it. I hope to have it finished and online by March 31. I hope. I know editing is a very, very long process. There might be problems with content or plot I wasn’t aware of while writing. All these things will reveal themselves, but I promised myself and my readers that it would be out in March, and I’m trying my best to meet that goal. The good news is, the raw product is there and it just needs to be refined. It’s a lot longer than I originally planned it. It’s technically a novel now, and not a novella, at about 54,000 words. I needed that much to tell the story without rushing it – yet at the same time, some of it might be superfluous and can be cut. Like I said before, I need to read it first to see. I guess readers will get more bang for their buck, and it sort of addresses the semi-complaints that the first was too short (although, I meant it to actually be shorter). I’m excited to go back and edit it. That might sound weird, but I’m really interested in seeing how the story actually reads. I’ll probably break from it for a couple of days…maybe more. I wish I could for at least two weeks, only I don’t really have the time for it. I really want to get started and have it done as quickly as possible. 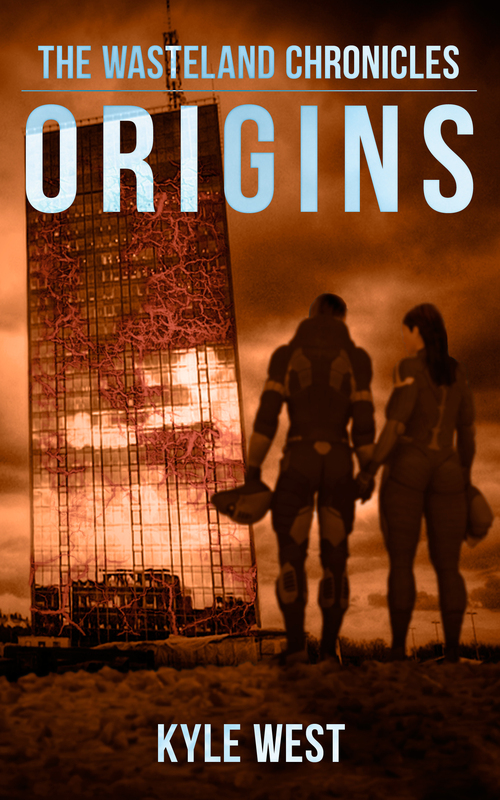 For better or worse, Origins is here. I’m pretty astounded at the results of the Goodreads giveaway. From 2/26-2/27, I offered up a signed copy of The Wasteland Chronicles and about 650 people entered to win, and about 300 added me on their to-read list. I just got back from the post office an hour or so ago and waited in line forever to send the book to a gentleman in Leeds, Yorkshire. Then I found out I had to fill out a customs form, and the lady made me go the the back of the line again so I could fill it out. Still it didn’t kill my mood because I was happy about the astounding results. To everyone who participated in the giveaway if you happen to be reading this, thank you very much for participating. I definitely plan on doing more in the future…keep updated with this blog or my Twitter. Hopefully I can get book 2 out sometime soon. I think it would be cool to combine all the books in a big volume once all is said and done and offer that up as a giveaway prize, but that’s still way far down the road.